This is a special compilation cd from one of my all-time favourite bars. Unfortunately it is located in London and I live in Copenhagen, so I don't get to go there every weekend but I like to hang out there when I have the chance. It's a rock'n'roll bar for hardrockers and punkrockers and there is tons of collectible stuff above the bar as decoration and it has a rich history since a huge amount of rockstars have visited the bar in the past. Red Stripe is my preferred beer there and it goes very well with Jack D and Coke. 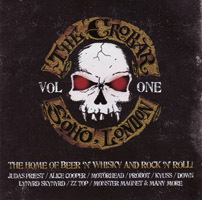 Back to the 2cd compilation: it features bands like Motörhead, Alice Cooper, ZZ Top, Judas Priest and many many more. It reminds you just how great the jukebox is at this particular bar. The music mix there is just awesome. This compilation however doesn't quite do justice to the jukebox, so I'd advice you to go experience it live instead.